Researchers at Utrecht University, including Albert Heck and Simone Lemeer, have revealed structural changes in a receptor that plays a key role in many types of cancer. The changes occur before and during receptor activation. These findings provide novel clues to develop medication to target the disease. For the first time, a receptor of this size could be studied in its natural environment. The researchers are publishing their results in the journal Cell this week. The researchers studied a receptor that can be activated by the epidermal growth factor (EGF), a hormone that stimulates cell division. Genetic defects can lead to too many of these receptors in the cell membrane. This overstimulates cell division, leading to cancer. To study the EGF receptor, the Utrecht scientists used a new approach in the field of NMR spectroscopy. This enabled them to observe structural changes of the receptor in its native environment – the cell membrane. “Previously, only parts of the receptor had been analysed and then only outside its cellular environment”, says Marc Baldus, professor of NMR spectroscopy at Utrecht University and one of the publication’s authors. “We can now observe how the receptor behaves in a cellular setting. This technique has great promise and can also be used to study other proteins associated with cancer or other diseases, such as Alzheimer’s or Parkinson’s”. Using the method, the researchers discovered that the receptor continually changes shape in the absence of the EGF hormone. 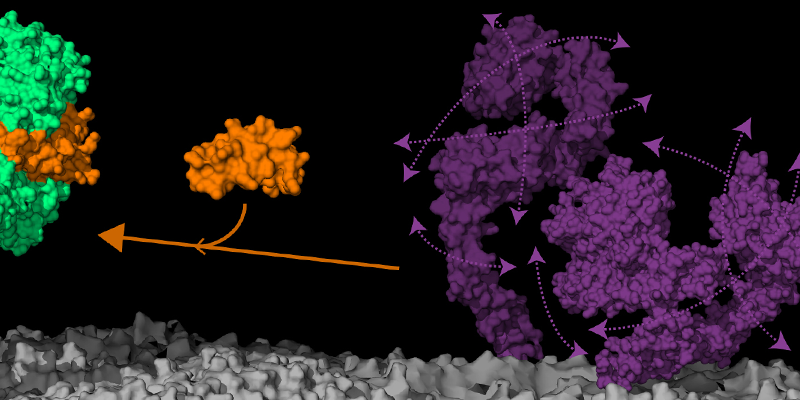 “We believe that the receptor in its ligand free state is continually switching from a ‘closed’ to an ‘open’ position and vice-versa”, says Paul van Bergen en Henegouwen, cellular biologist at Utrecht University and one of the authors of the article. “It so to speak dances around and continuously bows for its audience”. This research is conducted within Utrecht University’s research theme Life Sciences and was supported by the Netherlands Organization for Scientific Research (NWO).